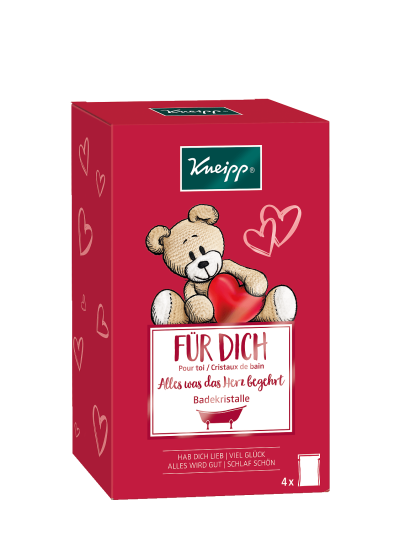 Hab dich lieb/Je t‘aime bien: Sodium Chloride, Parfum (Fragrance), Vaccinium Macrocarpon (Cranberry) Seed Oil, Rubus Idaeus Seed (Raspberry) Extract, Citrus Aurantium Dulcis (Orange) Peel Oil, Limonene, Citronellol, Benzyl Salicylate, Polysorbate 20, Rosmarinus Officinalis (Rosemary) Leaf Extract, Sodium Carbonate, Sodium Methyl Oleoyl Taurate, Tocopherol, CI 16255. | Viel Glück/Bonne chance: Sodium Chloride, Parfum (Fragrance), Averrhoa Carambola Fruit Extract, Oxalis Tetraphylla Extract, Citrus Aurantium Dulcis (Orange) Peel Oil, Limonene, Linalool, Geraniol, Polysorbate 20, Glycerin, Aqua (Water), Tocopherol, CI 47005, CI 10020. | Alles wird gut/Tout ira bien: Sodium Chloride, Parfum (Fragrance), Vanilla Planifolia (Vanilla) Fruit Extract, Macadamia Integrifolia/Tetraphylla Seed Oil, Honey Extract, Juniperus Mexicana Oil, Helianthus Annuus (Sunflower) Seed Oil, Coumarin, Anise Alcohol, Polysorbate 20, Hydrogenated Palm Glycerides Citrate, Glycerin, Aqua (Water), Tocopherol, CI 19140, CI 16255. | Schlaf schön/Dors bien: Sodium Chloride, Parfum (Fragrance), Bellis Perennis (Daisy) Flower Extract, Malva Sylvestris (Mallow) Flower Extract, Citrus Aurantium Dulcis (Orange) Peel Oil, Limonene, Anise Alcohol, Linalool, Benzyl Salicylate, Geraniol, Polysorbate 20, Glycerin, Aqua (Water), Tocopherol, CI 73015, CI 16185.